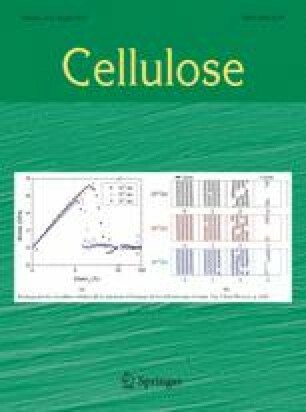 This study confirms the enzyme-mediated phosphorylation of cellulose nanofibers (CNF) by using hexokinase and adenosine-5′-triphosphate in the presence of Mg-ions, resulting in a phosphate group’s creation predominantly at C-6-O positioned hydroxyl groups of cellulose monomer rings. A proof-of-concept is provided using 12C CPMAS, 31P MAS nuclear magnetic resonance, attenuated total reflectance-Fourier transform infrared spectroscopy and X-ray photoelectron spectroscopy (XPS) analyzing methods. The degree of substitution (DS) is determined by elemental analysis and compared to DS estimated by XPS analysis. From the thermal degradation measurements using thermo-gravimetric analysis, the C-6-O phosphorylation was found to noticeably prevent the CNF derivatives from weight loss in the pyrolysis process, thus, providing them flame-resistance functionality. Furthermore, phosphorylation significantly enhanced adsorption capacity of Fe3+ ions making them interesting for fabrication of biobased filters and membranes. Finally, the biomimetic growth of Ca–P crystals (hydroxyapatite) in simulated body fluid was characterized by scanning electron microscopy and energy dispersive X-ray, showing potential application as biomedical materials. This work was financially supported by the European Commission under the NanoSelect project, Contract No. FP7-NMP4-SL-2012-280519. The authors are also grateful to Prof. Dr. Janez Plavec from the National Chemistry Institute and Prof. Dr. Janez Kovač from the Institute Jozef Stefan, both from Ljubljana, for the performance of NMR and XPS analysis.